How spray foam insulation can protect buildings that have a complex design. Some homes still rely on an old, fiberglass batt insulation that's made from spun glass fibers. But if you're looking for a star player on the insulation team, a standout with qualities that other types of insulation can't touch, it's got to be spray foam insulation. More specifically, we're talking about closed-cell polyurethane spray foam insulation. As your local insulation contractors, Dr. Energy Saver Central Maryland can increase your home's comfort, optimize your home's energy efficiency, and decrease your utility bills with spray foam insulation in Bethesda, Rockville, Gaithersburg, and nearby in Maryland. Before and After Air Sealing an Air Duct in Silver Spring, MD: Another homeowner's air ducts leaking valuable air. We solved this problem by spraying the air duct with spray foam. Before and After Insulation in Gambrills MD: This customer was in need of new insulation in their attic. They were having issues with hot rooms during the summer throughout their house. Air ducts are always a bad idea in attics because of so much air leakage. We fix this problem by air sealing the space before adding insulation. R-value: Poly spray foam insulation has a higher R-value per inch than any other commonly used insulation — R-6.2 or higher. Airtight barrier: Spray foam is often spot-applied as an air-sealing treatment prior to filling an attic with blow-in insulation. But given spray foam insulation's ability to expand and fill gaps, when applied in more generous amounts it can provide an ideal air-sealing solution. Stays put: Since spray foam insulation has super-adhesive qualities, it stays in place longer. Waterproof: Moisture will soak through fiberglass and cellulose insulation, but polyurethane spray foam blocks this. Its closed cell structure means that water can't migrate from one tiny cell or bubble to a neighboring one. Foolproof: Did you know that an insulation void of just 5% can diminish overall performance by as much as 50%? It's very difficult to install fiberglass insulation perfectly, so voids are not unusual. But spray foam's expanding, super-sticky characteristics eliminate the possibility of voids. And once the foam cures, it's not going to settle or shift. 1-part foam: This single-component foam is super-sticky and expands at different rates immediately after application. Since it seals gaps and insulates, this product is often referred to as an "insulating foam sealant." 2-part foam: To insulate an entire basement or attic with spray foam, contractors use a 2-part polyurethane foam that comes in a pair of pressurized metal containers. When both components are mixed together at the nozzle, a foaming chemical reaction takes place that causes the material to expand. A versatile energy-saver. 2-part spray foam insulation expands after it's applied, creating an effective thermal and moisture barrier. Thanks to its unique properties, it can be used to solve comfort and energy problems. 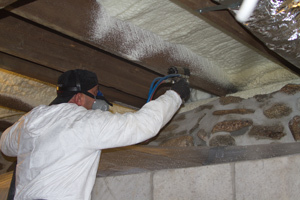 Tricky Application: It takes experience to apply spray foam insulation, especially two-part foams. Given their different expansion rates and other qualities, applying the foam could prove difficult for those without expertise. Oftentimes, contractors can waste spray foam or create a mess — but our fully trained specialists know how to get the job done right the first time! Temperature sensitive: Cold temperatures affect the foaming action. It's critical to keep spray foam cans or two-part foam canisters within a specific temperature for a successful application. If you're interested in spray foam insulation for your home, the local experts at Dr. Energy Saver Central Maryland can help. Give us a call at 1-833-483-5965 or contact us online for a free estimate — we are your trusted insulation contractor in Bethesda, Rockville, Gaithersburg, Glen Burnie, Pasadena, Laurel, Severna Park, Severn, Highland, and nearby. We also offer a comprehensive home energy audit to diagnose the major contributors to your home's energy issues.